If you have experienced issues with your fertility health either now or in the past, we’d love to hear about your experience. 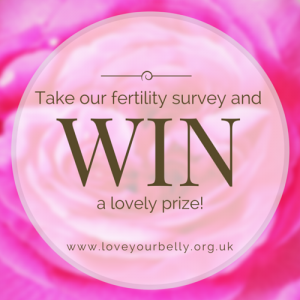 We are fine-tuning our fertility workshop for September and want to tailor it to meet your needs, so would love it if you could add your voice to our fertility survey; it will only take a few moments and you could win a lovely prize too! You can complete the survey below, just scroll down and click ‘next’ to get to the questions. Thank you! We really appreciate your time and opinions.